Creatine Monohydrate, Amino Acids, (L-Citrulline, Beta-Alanine as Carnosyn®, N-Acetyl L-Tyrosine), Acidity Regulators (Citric Acid, Malic Acid, Tartaric Acid), Flavourings, L-Carnitine, Vitamins (Pyridoxine Hydrochloride, Nicotinamide, Calcium D-Pantothenate, Cyanocobalamin, Thiamin Hydrochloride, Cholecalciferol, Pteroylmonoglutamic Acid), Colours (Beetroot Red, Beta Carotene, Curcumin), Grapefruit Bioflavanoid Complex, Natural Caffeine, Colour (Lutein), Thickeners (Cellulose Gum, Xanthan Gum, Carrageenan), Anti-Caking Agents, Silicon Dioxide, Calcium Silicate), Sweeteners (Sucralose, Acesulfame L), Panax notoginseng Root Extract Powder. 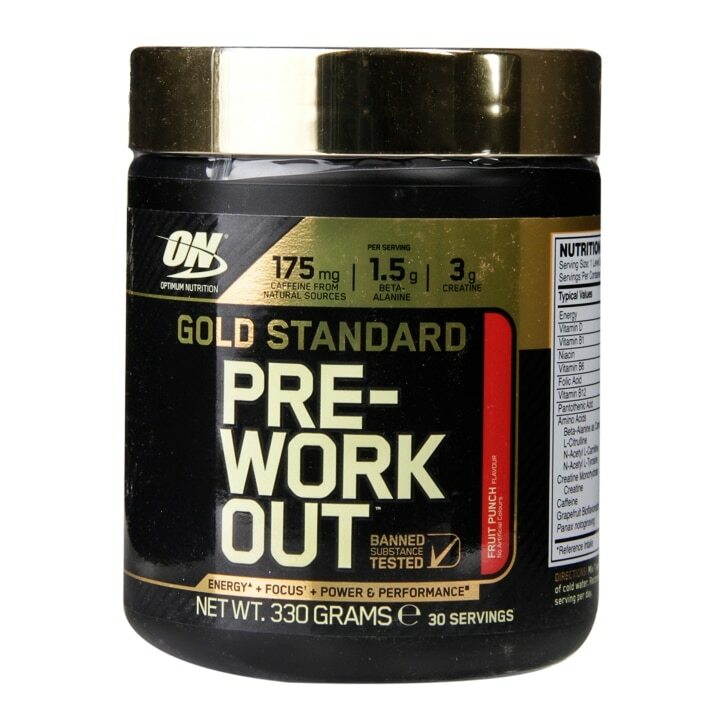 Optimum Nutrition Gold Standard Pre-Workout Powder Fruit Punch is rated 4.6 out of 5 by 23. Rated 4 out of 5 by Sophie247 from Noticeable difference Bought this a few weeks ago and I’m seeing a noticeable difference in the energy I have to do a workout. its really working for me and I’d recommend it.